This car has been stored awhile- but ever since it was new and still today- no one seems to be able to fix it...I have yet to see it- owner is 100 miles away and wants desperately for me to fix it. Symptoms are- it cools great, perhaps too great- such that after about 15 miles driving, you notice the water vapor pouring out the vents- then in about 5 minutes after the vapor, the fuse (thermal) blows on the fender- I would have thought it was the one on the A6 compressor. Owner buys fuses 10 at at ime to continue to run the system- As soon as he sees the vapor, he tries to shut it down to avoid blowing the fuse again. I haven't researched this sytem yet, I assume it is a POA system- and for some reason whatever averts evap freeze-up is not functioning- There may be a faulty thermal evap sensor for all I know so far.. So what do you old-timers know about the above issue? I'm old, but not that old...never really dealt with these systems- how does the fuse blow? if it is not the thermal fuse mounted on the compressor? I asked owner twice where the fuse was and he maintains it is not on the compressor....did they make thermal fuses that sense compressor heat remotely somehow? Had that same problem on a 73 Caprice. It was the POA sticking. Changed the POA and problem solved. I know this was the problem as it was my own vehicle. All normal checks indicated a working POA. The thermal limiter would randomly give up the ghost. I originally thought there was moisture freezing the TXV so I changed the drier. Nope, it still did it. POA's used to cost 16 bucks so I changed it and never had another problem. Those were the good old days. I am searching for a GM service/TSB concerning the correct procedure for adding lubricant to the 'V' series compressors. I seem to remember reading this....well...it has been a while. GM got any leads? V-5 compressors, when off the car and being installed as service compressor get the entire oil charge in the crankcase- by removing the oil drain bolt on its belly- When on the car, the compressor usually has 3 ounces in the crankcase at any given time- and oil added can be through the suction port. The constant blowing of the thermal fuse is a dead giveaway to either a low charge - which is I doubt is the case with a 40 year problem - or bad POA or TXV. Water vapor coming out of the vents is similar to air blowing over ice. Real quick test on the POA... run the engine at 1,500-2,000 RPM and disconnect the blower motor wire. If the low side pressure falls below 28.5 PSI, that pretty much confirms the POA is bad or way misadjusted. To avoid blowing another thermal fuse during the test, temporarily disconnect the black cap terminal from the superheat switch. I'm surprised it's still connected (confirmed by the thermal fuse blowing), most typically got knocked off during service, especially when replacing the spark plugs under the compressor. I seem to recall those compressor mounted superheat switches were charged with R-114, and the black cap connector never really fit that tight. I bet many A-6 compressors in the day were lost due to either accidental or intentional disconnection of the superheat switch... hey, I disconnected this here wire and now I don't have problems with that fuse blowing all the time and my A/C works good! My order might be off, but what happens is power normally flows from the 12V supply to the compressor clutch through this fuse (b and c). 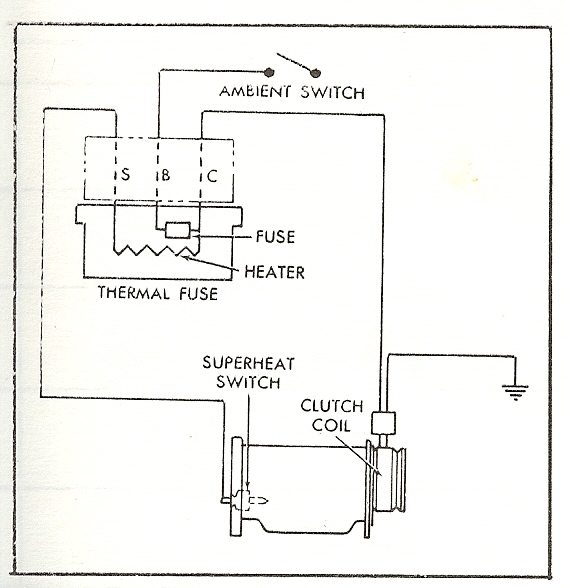 If the superheat switch, charged with I believe R-114, senses low side pressure is too low, it closes, and now power flows through a small heater element in the fuse (a and b). If the heater element is on long enough, it gets hot enough to melt the fuse... kind of like a fusible link with a little bit of help... and power is cut from the 12V supply to the compressor. The idea is provide a delay for momentary low pressure spikes that could result from the POA throttling, or other temp low pressure conditions. This was my time "under the hood", and we had a slew of these blown fuses when this design came out. Remember- these were new cars, no leaks, tight systems and ran fine,were under warranty, but would just randomly blow these fuses. Could not get any good feedback from GM, ran the parts dept. 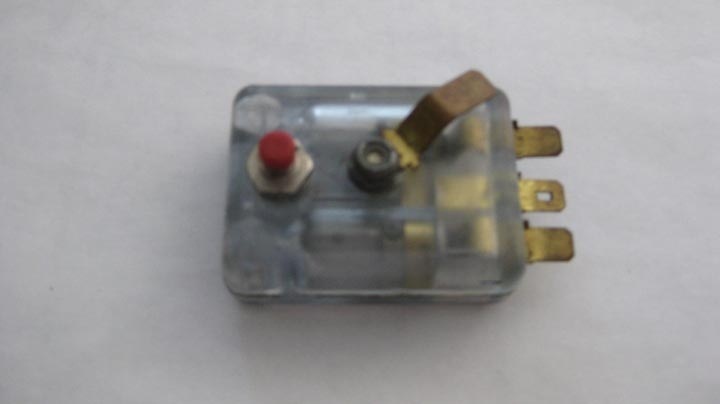 out of these fuses, people were going nuts in hot weather, we knew we had a lousy design, so we put an in line fuse, 20 or 30 amp comes to mind, road tested the car, they always worked to specs and we told them to come back in a month or so and we would put the proper fuse in. No one ever came back because it worked fine. Customers where happy, NEVER saw a burned out A-6. At GM school, they told us they would ONLY blow at low pressure, high temperature when we questioned what they were for. Yeah, sure. So if disabling or bypassing the safety feature works- then why not just unplug the superheat switch? To make it simple....Just my thoughts. One of GM's fixes was to clamp the thermal limiter onto the suction line. I have a tool that eliminates the thermal limiter for troubleshooting. I'll try to find it and post it. STV, then the POA, is seems to me that sometime in that era, GM switched to a thermostatic switch mounted on the firewall. Checked my old library, missing my old 1972 Professional Motors Manual. That's all you needed back then, think my city library has that yet, could check on that. They also had ACC back then, how is this vehicle equipped? That thermostatic switch, switch on the compressor circuit, besides a motorized blend door, and a motor that rotated a vacuum switch for the various modes, memory is getting kind of bad. Check to see if your library has the old Professional Motors manual, gave complete specs on the AC system. Know I had a complete set from around 1932 clear up to the late 70's, must have loaned those out to somebody. After that was shop manuals. Remember when they were 43.50 each including postage? Just gave those away when I got rid of the corresponding vehicle. Compressors were always around 4 amps, blower up to 24 amps, either of those can blow fuses. Hi GM Tech- Remember that the cars were new, under warranty, and the new design was not fully understood, so we could not randomly disconnect stuff. If it DID fry a compressor, and they went to a different dealer, their mechs would notice this and we would look stupid, so we did the safest thing possible. Looking back, I think they should have built the fuse a little more robust. I think it was just too delicate. You could conceivably disconnect the superheat switch, but then of course you bypass any low pressure and low refrigerant charge the system might have. The vehicle owner will still get the fog coming out of the vents, since the underlying concern has not been corrected. As you know, a low pressure condition could eventually lead to compressor damage. If it's determined the POA is bad - which again is likely causing the thermal fuse to blow - finding a NOS POA valve will not be easy, and will be super expensive. It's possible that original valve was way misadjusted and can be corrected. Mitch had some great writeups on adjustment procedures and fabricating fittings. Doug also has posted a lot of excellent info as well. If you don't want to go NOS or bench testing, a boneyard pull from a system that's still intact could be a good choice, since these valves very rarely failed. I even remember Mitch disassembling and cleaning up these valves to work as good as new. Whatever you do, don't even entertain the thought of a POA eliminator!!! Will this guy be thrilled that 30 year problem has been solved. Here is the test device. If the correct lamps light, the circuit is good and by pressing the red switch and using the brass hold down you could run the the system. Nick could definitely make one of those! Hi Dougflas and others-- Great stuff! We never saw anything like this device. Any follow ups on more info from anyone on this problem that GM addressed as to later fixes would be welcome. I thought this stuff was long forgotten! That's why I love this group!! For me back then was mostly Buicks and Cadillacs, feel like I am in the dark with a Monte Carlo. Worked on some later model Pontiacs, but that was went GM came out with that wonderful CCOT system. Maybe somebody will wake up Tim so he can post a circuit diagram, if he has one. All I can find on this model, employs an A6 compressor, has an expansion valve, an accumulator, evaporator, condenser. Compressor has a pressure release valve that was approved by the EPA back in 1972. Come to think of it, the EPA just started to go into business back then. But nothing about the regulator nor the control circuitry. Joe's circuit throws me for a loop with that superheat switch, just don't recall the word superheat ever used with MVAC. And is that really a fuse or a circuit breaker? Certainly recall the ambient switch, weren't very accurate. No Econ back then, darn compressor was running practically all the time. So would installed a rocker arm switch under the lower left dash panel to break that line. Even back then the compressor didn't do very much at 33*F and was just wearing it out. In particular in the neck of the woods where AC was only being used about three months out of the year. They lasted a lot longer that way. In a TXV system, the compressor can overheat if it is kept running with a very low refrigerant charge. Many Japanese cars have a thermal switch on the compressor to protect against that, the switch is supposed to reset itself. Okay folks- got the scoop-- photos of the car are in- kindly e-mailed to me from owner's son....looks like a POA and a TXV at evap inlet--is this normal? is that the POA in last photo? There is also an r/d on condenser outlet- was that normall? There is a POA on this system. It has been changed as evidenced by the white plastic band around it. This is the control against freeze ups. It maintains the evap pressure. Using R12, the sight glass should be clear. The POA is checked by disconnecting the blower motor lead, RPM at 1200, low side should drop to 28 and no lower. Some of the inherit problems were the oil bleed line (small tubing attached to it) would get blocked by oil. Also, there is a SPECIAL valve core in that line at the POA. This is a low pressure core so do not use just a regular core here. If the low side does not get lower than 28PSI, the POA is probably ok. Be aware, the POA can be intermittently sticking which will allow a freeze up. Test the TXV next by removing the sensing bulb, placeing it in your hand and then a cup of crushed ice. Watch the gauges, you should see a difference. On our tips and proceedure section I posted a proceedure to check Chysler EPR systems. The are basiclly the same. And to answer your question, there is no evap thermal cycling switch used here. The A6 compressor does not cycle on or off. Something else to check is the orange heavy wire to the high speed relay which is know to develop high resistance connections. Normally locked on the firewall near a V8's distributor. With the symptoms GMTech posted, would sure take a close look at that clutch coil. Random wound magnet wire, works well when cold, but when it heats up, wire expands and shorts out that will blow a fuse. Hooking up a power supply, 14.5 volts and look at the current its drawing, don't stare at it, look again after 15-20 minutes has passed. If say it read 4 amps at the start, should read well less than that after that period because copper has a positive temperature coefficient, would expect around 3.5 amps when hot. But if it drastically increases, have to either rewind the coil or get a new one. If these were layer wound and penetrated with varnish, would last forever, but they don't do that. Ha, back then, 12 months or 12,000 miles, whichever came first. Supra doesn' have that superheat switch and is a TXV system, does have a dual function switch that limits compressor operation between 30-384 psi, also an ambient temperature system, has to be above 33*F, also an evaporator thermostat, switches on at 39*F and off at 33*F, also an engine temperature switch, in heat mode, only lets the compressor run above 104*Fm but will kill it above about 210. As I recall, the A6 always ran, beating my brains for a low pressure cutoff switch, don't believe it had one, ambient would cut it off below around 33*F, no other means to turn it off except put the mode switch in the off position, but then no heat. So I guess it needs that thermal switch, just don't recall it. But as complicated as life is becoming, know I am going to crack up one of these days, maybe I have. Ha, use to have a photographic memory, but now, way over exposed.